It was 1973, and I’d been traveling in Africa and the Middle East for nearly two years, sometimes hitchhiking, sometimes on the beds of clunky trucks, sometimes on trains when nothing else was available. I was now in Sudan, taking the last leg of the long train voyage from Khartoum to Wau. This final leg, from Al Ubayyid to Wao, would last four days, traveling over hot, sandy terrain, with little more than spiky acacias to define the passage of kilometers, jouncing one after the other, as the little train creaked along. I prepared myself to be bored. The third-class car was so full I couldn’t squeeze my backpack through the door, let alone get in myself. Many boys, in school in the north, were returning to their homes in the south for spring break; the car itself was full to swelling; heads, arms and bodies poked out of the open windows and the roof of the train was covered with boys in their billowing dirty-white jalabiyas. I wondered if they sold fourth-class tickets for the roof of the car. It’s going to be a very long four-day ride, I thought to myself. I stood, stranded on the platform, not knowing what to do. The conductor saw my problem. “Come,” he said in Arabic, and directed me to the first-class car. “Stay here,” he motioned, pointing to the floor, as first-class contained only private cabins with berths. I could stay in the corridor outside the cabins, along with twenty or so men also inhabiting the floor. Good idea, I thought, considering my options. I thanked the conductor for this upgrade and moved in, sat on the gritty floor, leaned against my backpack, and began reading. At 31, I could still manage a hard floor. We’d been lurching through the desert for about an hour when a well-dressed northern Sudanese man approached me. “My wife would like to invite you to stay in her cabin,” he said in perfect English. I was surprised and delighted, not only because it would be much more comfortable than the floor on which I was sitting, but it would also allow me to meet some Sudanese women. “Shukran!” (thank you), I replied, showing off one of my few Arabic words. He led me to his wife’s cabin, introduced me to her and left for his own cabin. The cabin was tiny. In it were two women who I presumed to be a mother and daughter, the younger woman with a girl about four years old and a baby. We had one of those pidgin-English-Arabic-mime conversations, sweet, heartfelt, not going too deep, but where affection is expressed in gestures, warm smiles, sighs and soft eyes. After an hour it was time to go to bed. Just as I was climbing up into the upper berth we’d converted from the seat, the conductor knocked at the door. The older woman opened it. Seeing me in the upper berth, he started shouting at me in Arabic. The women looked on silently. I didn’t understand his words, but it was clear that he was ordering me to leave the cabin. 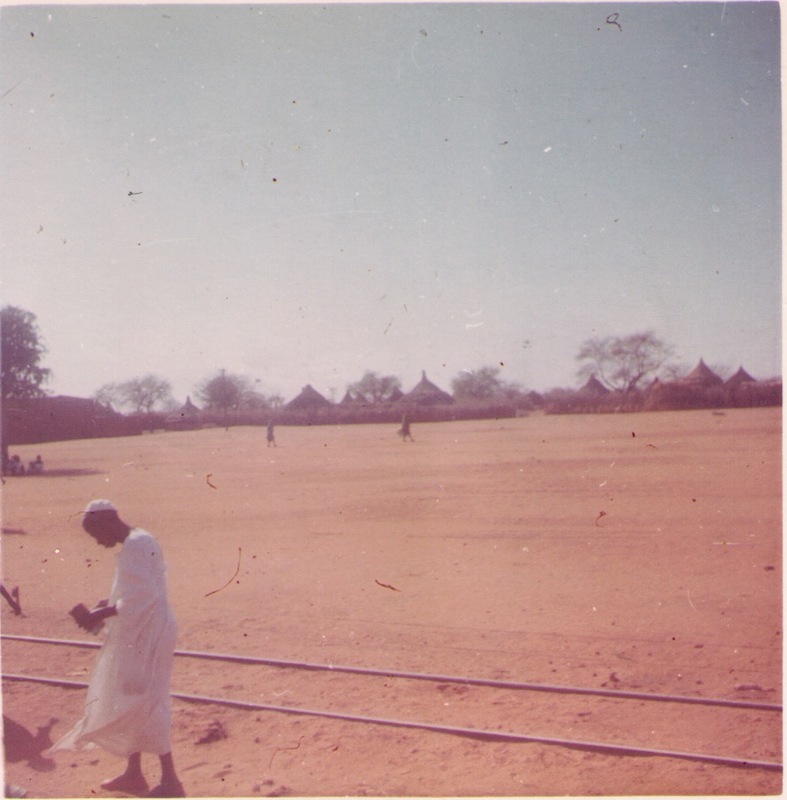 I said shukran, gestured goodbye to the women and children and reluctantly returned to the corridor floor, where I slept fitfully, my head on top of my backpack, with twenty other sweaty Sudanese men, all in their jalabiyas, surrounding me, lying on the hard, gritty floor. It was unpleasant, but at last morning came and with it some relief. But not for long, because soon the conductor approached me, saying half in Arabic and half in English, “You stayed in first class. You must pay first-class ticket.” I was incensed! Had I been able to stay in the sleeping compartment, I’d have paid. But to pay for a first-class ticket when I had to sleep on the floor with twenty men? Not on your life! It was totally unfair. Arms crossed, eyes glaring, I shouted back at him, “But I had to sleep on the floor! I’m not paying!” forgetting he probably didn’t understand my outraged English, although my body language was clear. I reddened with shame. The generosity of the kind man and his wife was impressive and touching. In contrast I felt very small. I’d hoped my “Ugly American” days were behind me, but there I was again, entitled, righteously indignant, without even thinking about the reality of the situation—the primitive state of Sudan’s infrastructure, the poverty of the country and how intimately linked poverty was with corruption; how I, as an American, choosing to ride fourth class, was seen as rich. The conductor wanted to add something to his meager earnings and saw he had a chance with me. Would I do that if I were poor and needed to feed my family? Pamela Blair is a 76-year-old retired psychologist who, in her early thirties, dropped out of a career to take a three-year trip, traveling overland through Europe, the Middle East and Africa. This trip and the people she met along the way have radically changed her outlook on the world and the people in it. You can read more of her travel stories on her website at https://pamelabsite.wordpress.com.